Starting on the morning of Wenesday 1st March, I will be taking part in Labour Behind the Label's 6 Items Challenge. The charity supports the rights of garment workers all over the world, who are often exploited or placed in danger while working long hours to make the clothes we take for granted. Until Easter, my wardrobe will only consist of six 'key' items (I'll be allowed to change my underwear, socks and shoes, I'm sure you'll all be relieved to hear! ), and I've deliberately picked items that I didn't buy brand new. My wardrobe for the next six weeks! I buy most of my clothes from vintage or charity shops now, but because it's harder to buy an intentionally matching or complementary capsule wardrobe when you don't know what clothes are going to be available, it's easy to see these shops merely as sources of 'novelty' options to add a bit of colour or quirkiness to our 'everyday' wardrobes. I'm lucky that I don't have a dress code to follow at work, and that I have a large existing wardrobe of clothes to draw on, but hopefully the pictures from my 40 day challenge will show that second hand clothes can be versatile, hard wearing and appropriate for every occasion! I'm sure some of you probably don't see much difference between this 'challenge' and your existing wardrobe. Others may be wondering if it's not just a reason to post a bunch of selfies and feel smug afterwards, even though I haven't actually 'done' anything physical or arduous. I took this challenge three years ago and I found it drastically altered by clothes-buying habits; all the clothes I have bought since have been purchased with this challenge in mind. Do I love something enough to wear it over and over again? Is it comfortable enough or well enough suited to my lifestyle that I could keep wearing it even if I'm a bit bored of the style or colour? But really that's a side benefit of the challenge for me, I'm really doing it for all the women who have the same skill set as me, but whose work is so undervalued as to be seen as disposable by so many of us. 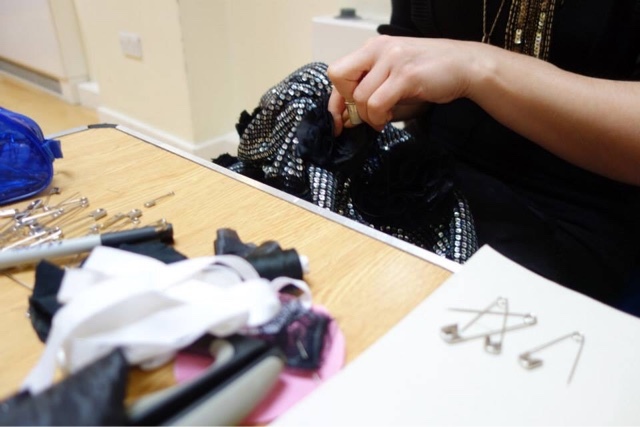 During the six weeks I'm participating in the challenge I'll be posting some tips I've picked up from my years working in costume making and wardrobe that we can all use to keep our clothes looking their best for longer. Over the next five days you'll be able to 'meet' my new capsule wardrobe (five dresses and one cardi; I'm currently packing away everything except my scarves and tights!) and donate to a very worthy cause over on my Everyday Hero page . One evening last June, scrolling through social media on my way home from work, I noticed several of my friends were (unsurprisingly) annoyed about a clickbait-y article listing items and styles of clothing women shouldn't wear past the age of 30. Against my better judgement, I looked, and by the time I got home I was determined to push back against depressingly petty and mean-spirited online content in a positive and funny way, so I gathered together all my age-inappropriate items (there were rather a lot of them), took some selfies and posted them on Facebook. The response from my friends was overwhelming, and a couple of people even reached out in personal messages to say how much it cheered them to see someone pointing out how silly fashion 'rules' are. I am Too Old for leopard print and graphic tees, apparently! It's easy for me to make fun of someone else's arbitrary ideas of what is "right" or "wrong" for a woman my age to wear, because my body (through no great effort of my own) conforms to "acceptable" beauty standards. I am unlikely to be ridiculed or insulted because of my appearance, and I haven't had to fight against society's expectations and prejudices to feel happy about the way I look. I am aware that many people don't have the luxury of saying "just wear what you want, who cares? ", because they will be judged, harshly and publicly. I think it was this realisation that made me uncomfortably aware of an unpleasant side of fashion that I'd always chosen to ignore. For a creative industry, fashion can be extremely conservative and short-sighted. For an industry that pretends to make us feel good about ourselves, the only way it seems to think it can generate repeat business is to make us feel inadequate. This saddens me, because many fashion houses are full of creative talent, but as the same styles re-emerge on the Spring/Summer and Autumn/Winter catwalks each year, worn by an identikit array of similar shaped people, I can't help feeling that everyone is stuck in a rut. So, because lists of fashion rules on the internet still seem to be a thing, here's my version. Don't worry, it's very short, and they're more like... guidelines. If this nonsense isn't going anywhere, get comfortable. Unless you run away to live in the woods, we are all going to need to keep wearing clothes, and you need to attend to your own levels of comfort before those of the fashion rule-makers. If you have many more hours in the day than I do, by all means feel free to perform complicated fashion calculus about the exact percentage of bare skin we should be showing. As for the rest of us, as long as you aren't wearing a t shirt emblazoned with swear words in front of a room full of small children, your outfit is probably appropriate. As a bare minimum, your day-to-day wardrobe should not make you suffer physical discomfort. Embrace individuality and difference. That means other people's, as well as your own. We could probably all stand to be a little less judgemental of everyone else's fashion choices. Take a moment to remember that other people's bodies, lifestyles and finances are varied and subject to change. Wear what you love, sincerely. Can we please abandon the concept of wearing (or doing) things we don't like, in an 'ironic' way? The more I think about this, the more uncomfortable it makes me. If the clothes you love aren't ever in the pages of glossy magazines, or are sneered at for being "so last season", ask yourself why the industry is so desperate for you to feel like your wardrobe isn't up to scratch. If your answer is "because capitalism", congratulations! You are correct! If you have spent years collecting unfashionable clothes that make you feel like your best self, you are setting a great example (and you look amazing!). Keep up the good work! Solidarity with your comrades. Support businesses who are doing good - brands who are transparent about their supply chain, pay workers a fair wage, and are passionate about their designs, thoughtful in their choice of fabrics. The fashion industry as a whole might just view you as a generic consumer, but plenty of small brands are looking to cultivate customer loyalty by appealing to you as a conscientious citizen as well as to your sense of aesthetics. "Your Fave Is Problematic" - is my enduring love of feminine vintage clothing quirkily subversive or depressingly traditionalist? I discovered the appeal of vintage clothes as soon as I was allowed out on my own with a monthly clothing allowance (supplemented with my meagre wages from scrubbing pots in the local pub). I went to school in Brighton and would meet up with friends to shop there on Saturdays; there were probably more vintage shops in the North Lanes than there were high street stores in the Churchill Square shopping centre before its redevelopment in the late 90s. Vintage clothes were similar in price to what was on offer on the high street and enough of my schoolfriends had a similar eye for a bargain so I wasn't afraid of taking a few fashion risks and standing out a bit. For my 18th birthday, I wore a 50s cocktail dress made from red organza with a flocked pattern of white flowers. I had the requisite LBD with spaghetti straps too, for clubbing, but my vintage clothes felt special and precious in a way that high street clothes never did. As other friends got into labels, my love of vintage persisted, even when one of my uni flatmates described a favourite pair of fleece-lined 80s pixie boots as my "dead person shoes". I found I was more attached to these clothes; they existed outside whatever the current micro-trends were and they reminded me of good times, or the fun I'd had searching for and finding them. Until recently, I hadn't thought about vintage as anything other than a reasonably priced way to stand out from the crowd, until I realised that people joking that I "wished I'd been born in another era" really bothered me, because I really, really don't. I am a big fan of 21st Century technology and medicine, and of all the (albeit imperfect) advances we’ve made towards gender equality. I realise that feeling nostalgic about an idealised past is a privilege; for many people, it's impossible to separate the past from some form of oppression. If I had been born in a different era I wouldn't enjoy many of the rights and freedoms I take for granted, and even mid-20th century vintage clothes tell this story. I have several 50s dresses that I really love because they are beautifully cut, but I can only really wear them at formal events; they were designed to be decorative but not practical, so if I want to preserve them as they are it's all but impossible to change their function. It's no coincidence that the more liberated 'Swinging Sixties' youth uniform of choice, the tunic dress worn with tights and boots, is my preference for everyday workwear. It's easy to be nostalgic about the beauty and elegance of trends past when viewing them in the microcosm of a well-curated vintage shop; the dresses I have bought to wear 'for best' probably had other owners who were similarly blessed with well-stocked wardrobes and didn't have to wear their clothes until they wore out. For every lightly-worn fancy frock, there would have been plenty of 'ordinary' clothes that were repurposed into newer trends, childrenswear, patchwork pieces, and finally ended their useful lives as household rags. In an ideal world, of course, we'd take what I (and, I suspect, many other vintage fashion fans) admire most about our treasured finds from yesteryear- the good quality, long-lasting fabrics, flattering design and durable craftsmanship, and improve on them for the 21st century. Now that we have the technology to create high performance fabrics that won’t irreparably damage the environment, and to design innovative clothes that don’t have to conform to outdated ideals of ‘acceptable’ bodies, shouldn’t we be working on creating the clothes of the future? Each decade has evolved bold new trends in response to the political climate and technological innovations, it feels like we’ve dropped the ball on both fronts. As a cis woman, dressing in a stereotypically feminine way to attend a function is the opposite of a radical act, but I can’t help feeling that seeing the beauty in, and proudly wearing, something old and pre-loved in a world that insists on the constant acquisition of new stuff is subverting this a little bit. Recycling should be our way of life, not something we only do occasionally when it’s convenient for us, but every time I get complimented on a vintage or second hand outfit, I like to think that I might be changing people’s perceptions and encourage them to think about the way they shop. At least, that’s my adult justification for the way my inner teenager shows off about what a bargain it invariably was. Some things never change.